Last night Big Red Machine, the experimental, somewhat grassroots project headed by Justin Vernon (Bon Iver) and Aaron Dessner (The National) played Terminal 5. The group have still only played a few one-off shows (mostly at festivals), and this was their first show since their album came out, not to mention their first in NYC. 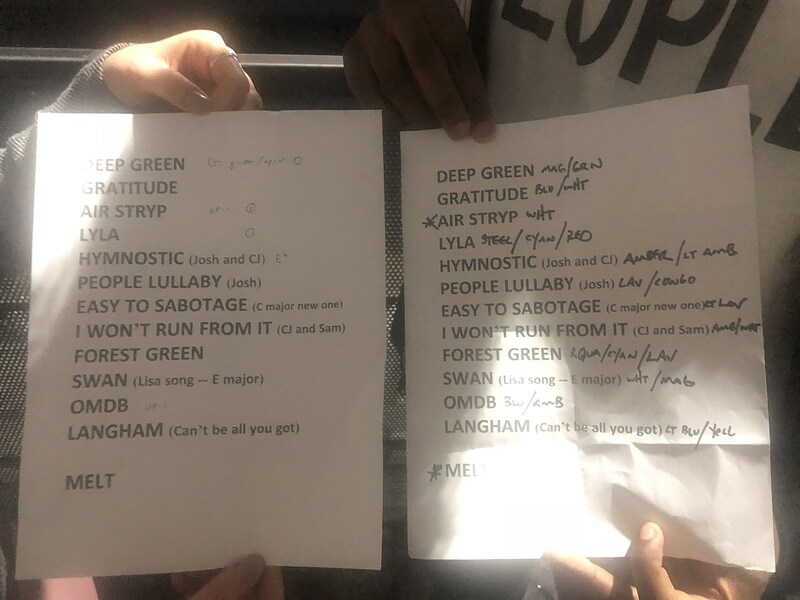 After lovely opening sets by Sam Amidon & Lisa Hannigan, and Naeem Juwan (aka Spank Rock), BRM took the stage, launching into the first song off their debut album, “Deep Green.” What followed was, as with previous performances, the entire album in order…give or take a few switches. With the core band that played on the album — Lisa Hannigan on vocals, Brad Cook on bass and omnichord, and JT Bates on drums — they were able to capture, with the help of lots of sequencers and backing tracks, much of the deeply layered, soulful R‘n’B and electronica of the record. Highlights were many, like the hip hop flavored “Lyla,” the beautiful, almost gospel-like “Hymnostic,” and the grand album/set closer “Melt” which had a wailing, hunched-over Vernon and Dessner summoning otherworldly sounds from their guitars. Much like the spirit of the PEOPLE collective (which Dessner talked up a few times), added players would come and go from the stage, including Sam Amidon on violin, Josh Kaufman (who has played with The National and recently toured with Bob Weir) on guitar, as well as a surprise appearance towards the end by Thomas Bartlett, aka Doveman. We also got a few new tunes which were very much in the style of the album. One, a beautiful song called “Swan,” which was written by Lisa Hannigan in collaboration with Dessner, can be heard currently on the PEOPLE’s website. One of the critiques of the Big Red Machine record is that it seems, on the whole, a collection of heavily programmed experimental pieces. Last night, performed live, this happily didn’t seem the case at all. These were living, breathing, fully realized songs. Songs that didn’t get lost in the oft maligned Terminal 5’s cavernous boxy interior, either. Drums and bass rattled the foundations while the wrenching vocals (albeit heavily autotuned, as is Justin’s style these days) and guitar filled up every nook. It was a sound both majestic and larger than life. After an hour of this grand performance with the final crescendo of the aforementioned “Melt” subsiding and a “that’s all we have” to the audience, a spent but elated Vernon and Dessner hugged with the acknowledgement that the future of this experiment is only just beginning. Photos from the show are in the gallery above and a picture of the setlist is below.